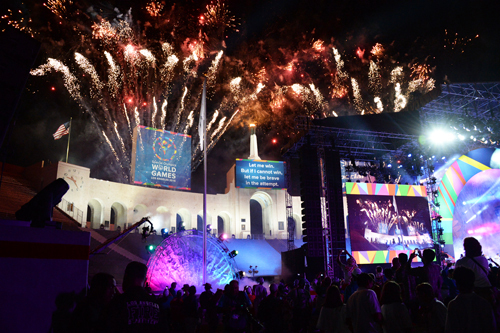 People all over the world have turned their attention to the city of Los Angeles, where the 2015 Special Olympics World Games are now underway. The international event, drawing 7,000 athletes, representing 165 countries and as many as 500,000 visitors, was founded in 1968 by Eunice Shriver Kennedy to give athletes with intellectual disabilities – like Down Syndrome and Autism related disorders – the opportunity to compete in Olympic-style events such as cycling, kayaking, swimming and soccer. 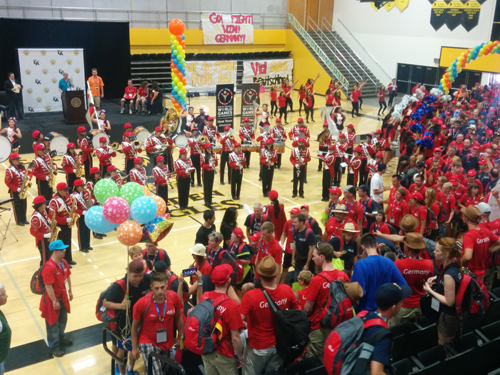 Delegations from all over the globe were welcomed to the World Games by hosts towns – from San Luis Obispo to San Diego — that put on special events and tours to give athletes a taste of local culture. Angelenos are encouraged to attend the athletic competitions – all free and open to the public –being held at numerous local venues through Aug. 2. 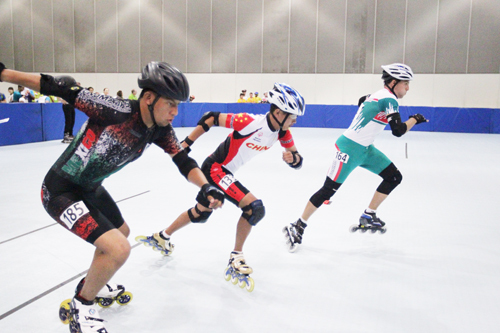 EGP has compiled photos that captured the journey to Gold and the local celebrations that led to the competitions. When plans for the 1984 Summer Olympics in Los Angeles were first announced, there were dire predictions of massive traffic delays and citywide gridlock: neither of which occurred. 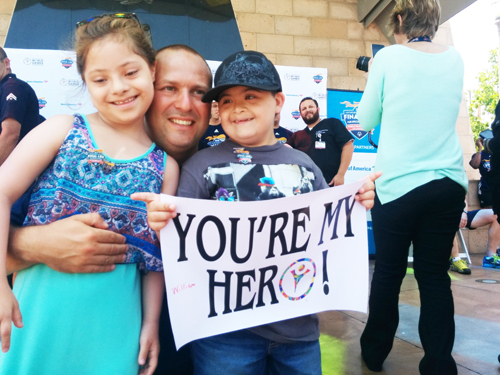 Transportation officials are hoping for the same results as hundreds of thousands of visitors make their way to Los Angeles this week for the 2015 Special Olympics World Games. 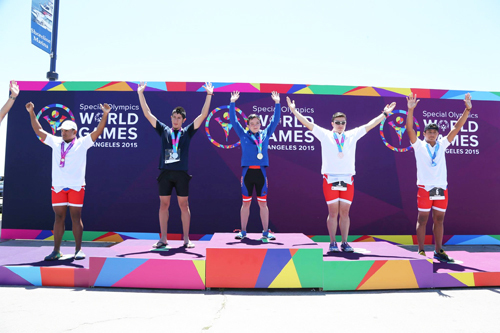 On Monday, Metro – the official transit provider for the World Games – announced that its rail and bus services would be in full swing during the weeklong international sporting event. 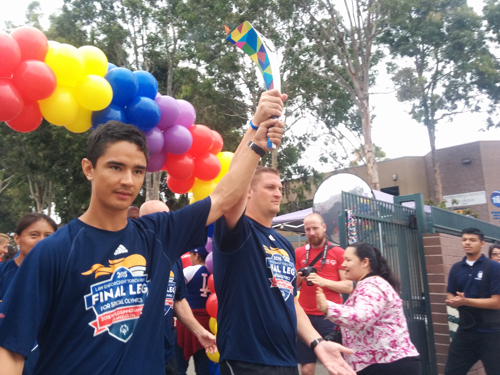 The agency plans to deploy additional rail, buses and staff throughout Los Angeles and Long Beach to accommodate the half a million spectators expected to attend the World Games from July 25 through Aug. 2. 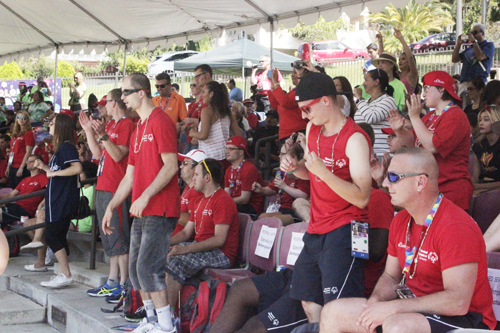 The World Games were created to promote the acceptance and inclusions of people with intellectual disabilities. 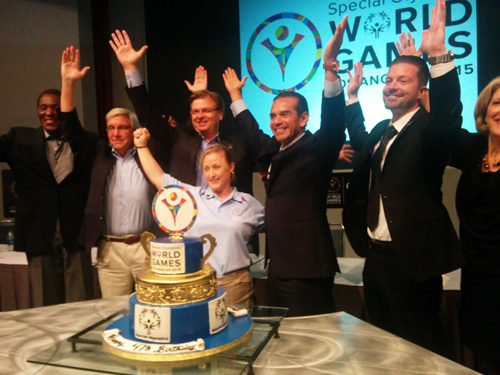 The Special Olympics World Games will be the biggest event to hit Los Angeles since the ’84 Games. Competitions will be held in Downtown Los Angeles, Encino, Griffith Park, Long Beach, and at UCLA and USC. Service on the Metro Expo Line will be expanded starting Saturday to help transport the thousands of spectators expected to attend the Opening Ceremony at the Los Angeles Memorial Coliseum. Trains will be longer to increase occupancy to 700 people per trip, in each direction. That day, trains will run every six minutes. Passengers will be able to get off at the Expo Park/USC Station for the short walk to the Coliseum. Games such as basketball and aquatics held on the USC campus will also be accessible at the stop. The Los Angeles Convention Center and Lucky Strike at L.A. Live will serve as venues for games such as bowling and powerlifting. Metro riders on the Expo Line or Blue Line can get off at the Pico Station to attend those events. The Balboa Sports Center in Encino will host 7-a-team soccer games. The venue will be accessible via the Orange Busway Line, which transfers from the Red Line in Hollywood. Alamitos Beach in Long Beach will host sailing and the triathlon. 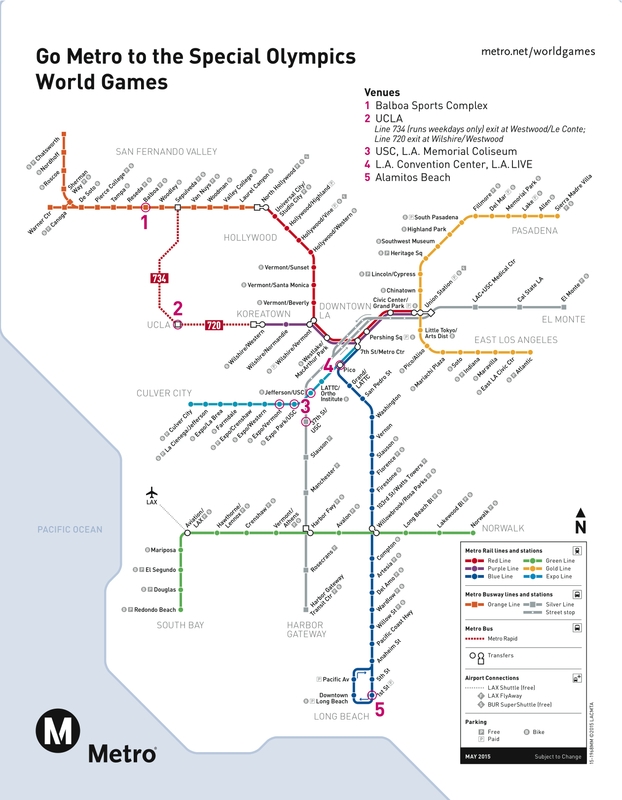 The various beach venues can be reached on the Blue Line, and exiting at the 1st Street Station. The UCLA campus can be reached by taking the 710 and 734 Metro Rapid buses. The school campus will host gymnastics, judo and other games. Metro does not have direct transportation via its rail lines or rapid buses to the Los Angeles Equestrian Center or the Wilson & Harding Golf Course in Griffith Park, where equestrian and golf events will be hosted. However, Metro recommends people headed to those events take the 94 and 794 buses to reach the venues. In addition to more frequent and reliable trains, late night service will also be extended until 2 a.m. on July 25, July 31 and August 1. For technically savvy commuters, the Go Metro app will be updated to feature a Special Olympics map highlighting stations near World Games venues. TAP cards commemorating the Special Olympics World Games are also available for purchase at vending machines. For specific competition schedules, visit www.LA2015.org. 1.Downtown L.A. (L.A. Convention Center/L.A. Live): badminton, bocce, bowling, handball, powerlifting, roller skating and table tennis. 4.Long Beach (Alamitos Beach): beach volleyball, half marathon, kayaking, open water swimming, sailing and triathlon. 5.UCLA (various): gymnastics, judo, 5-a-side soccer, 11-a-side soccer, softball, tennis and volleyball.